What does it mean to make it? It means, colloquially, to shoot for the stars and to land on a blazing one. How often, truly, this is a magical, almost miraculous occurrence, wherein one achieves one’s dreams? Most commonly, there must be a bit of a compromise, some haggling, between one’s imagination and one’s reality. The question then becomes, is one willing to settle for something not dreamed of? This is always most intensely felt among the most sensitive citizens of society – the artists. They have a particular vision of what needs to be given to society, of what, in an almost despotic manner, people should be appreciating. And yet, such obstinacy is normally the beginning and end of their downfall. People most generally want what they want, and it is hard to persuade them otherwise. To overnight have them appreciate a bygone era of Jazz, as in the instance of La La Land, leads one to ruin. Being uncompromising rarely works. And it isn’t until the stubborn Jazz musician protagonist in the film runs into an aspiring starlet that he is promoted to actually change his ideals. To, not “sell out” per se, but to sacrifice his hopefulness for a higher ideal that exists in reality: a woman he loves. Interestingly, we never hear him utter such a word (love). But his actions routinely demonstrate his adoration for her. His blind support of her aspirations, for instance, even physically committing to a torturous to and fro drive from Nevada to ensure her dream is kept alive to chauffer her to an audition, exemplifies a man who has developed a devoted concern for another. It is simply a cruel twist of fate then that the success he stumbles into drives them apart. But why couldn’t she be patient and wait for him to return from his successful musical odyssey? What, in other words, did she do in return for his gratitude and commitment for entering into her life? What act of compromise did she also comply with to make the relationship work? No doubt this is a quintessentially romantic film, with an elevation of human intimacy above the vulgarly carnal display of it in the mainstream today. Wherein, what is cherished as precious is the actual rarity of two humans finding closeness with one another. 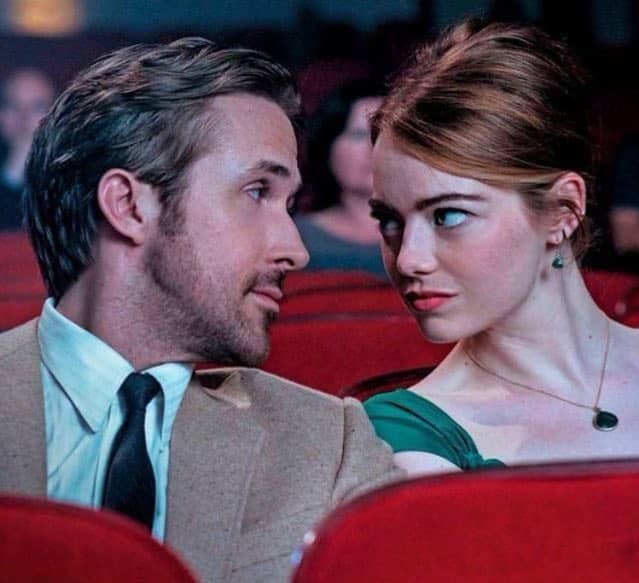 And, just as consistent as a classical cinematic romance, is the masculine sacrifice for the feminine depicted in La La Land. There is nothing wrong with this more or less risk-taking; an outright chance he took to better himself for the sake of another (or emphatically a woman). What is disconcerting, however, is the lack of appreciation by his counterpart. The fact the film shows the actress as a massive success later on in her career, while maintaining an innocence about her, is a fatal contradiction. Yes, perhaps in her mind she is a genuine artist and not a narcissist. But in the film’s reality, it is patent she uses the musician as a stepping stone if not a temporary dalliance on her pathway to stardom. Granted, the film convincingly and poetically describes the intertwinement of two struggling artists using each other as inspirations – muses more or less – in becoming better human beings. And positively, it uses the backdrop of Los Angeles to assert the novelty of such a becoming as being solely the domain of this copiously artistic city. Yet one cannot help but escape the residual of a woman who failed to recognize the tried advancements of a man to give her a better life as not a character worth caring for.